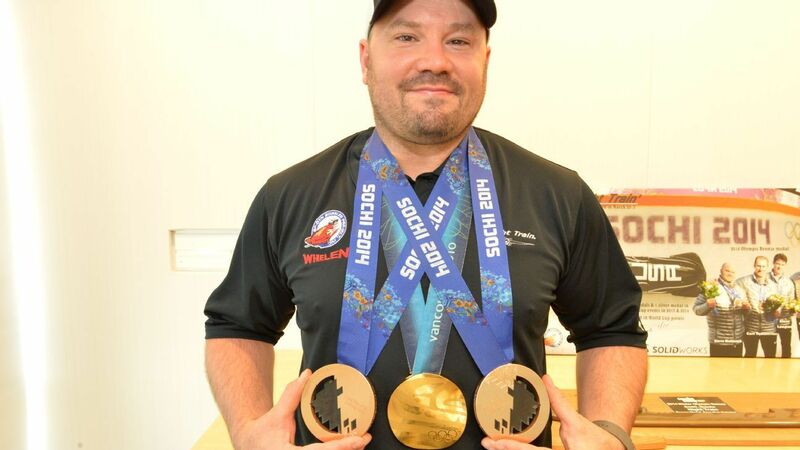 Steven Holcomb, who died nearly two years ago, had his 2014 Sochi Olympics bronze medals upgraded to silver after the gold medalist was stripped due to doping. Last month, Elana Meyers Taylor was named the Women's Sports Foundation's newest president. Last week, Meyers Taylor snapped a 24-win streak in bobsled. Is it any surprise her go-to song is "Run the World"? Elana Meyers Taylor and push athlete Lauren Gibbs ended Germany's 24-race bobsled win streak to give the U.S. its first World Cup gold medal in any sliding sport this season. Alexander Zubkov is resigning as president of the Russian bobsled federation after being banned for two years for doping at the Olympics, but left the door open to a return once his suspension ends. Francesco Friedrich drove his four-man bobsled team to victory on Sunday, keeping Germany unbeaten in World Cup races this season. Canadian bobsledder Kaillie Humphries told the CBC that she has filed a harassment complaint with Canadian officials, which is why the Olympic champion isn't competing in World Cup races this season. Johannes Lochner drove his four-man bobsled team to victory on Sunday, keeping Germany unbeaten in World Cup races this season. Americans Elana Meyers Taylor and Lake Kwaza have medaled in all three races they've been together this season with Saturday's silver and bronze in two others. With a win in the four-man, Germany improves to a perfect 9-for-9 in World Cup bobsled events this season. Russian bobsled federation president Alexander Zubkov is among five Russians provisionally suspended by the International Bobsled and Skeleton Federation for doping in fallout from the Sochi Olympics. Francesco Friedrich of Germany, with brakeman Martin Grothkopp, held on to win his second World Cup two-man bobsled gold medal in as many days. The Russian Olympic Committee has appealed a Moscow court ruling that sought to overturn a doping disqualification against a double gold medalist from the Sochi Winter Olympics. Jamie Greubel Poser, 34, has been to two Olympics with the women's bobsled team, won bronze at the Sochi Games and won a World Cup championship. She announced her retirement Friday, saying it's time to start a new chapter of her life. One of the four doping cases at the Pyeongchang Olympics has been closed in an agreement between bobsled's governing body and Russian driver Nadezhda Sergeeva. Olympic medalist Mike Kohn will coach the national team for USA Bobsled, and medalist Shauna Rohbock will serve as an assistant. Francesco Friedrich piloted Germany to a sweep of the two-man and four-man bobsledding gold medals, becoming the fifth German to record the achievement. Sunday's win in the four-man competition completed the country's three-event gold-medal sweep. A Russian bobsledder who tested positive for a banned substance at the Pyeongchang Olympics has admitted to doping and has been disqualified from the games. A second Russian athlete, bobsledder Nadezhda Sergeeva, has failed a doping test at the Pyeongchang Games, a day before the International Olympic Committee's executive board is to decide whether to reinstate the country for Sunday's closing ceremony. Germany's Mariama Jamanka drove to gold in the women's bobsled event at the Pyeongchang Games on Wednesday night, adding to her country's dominant showing at the sliding track. Elana Meyers Taylor and Lauren Gibbs of the U.S. were second in 3:22.52. Seun Adigun, Akuoma Omeoga and Ngozi Onwumere are a testament that there's no such thing as impossible. The Nigerian-Americans went from zero knowledge of bobsled to the track in Pyeongchang -- and landed in the record books for Africa. One of the most absorbing and highly-anticipated tales of the PyeongChang Winter Games finally came to the fore on Tuesday, as the Nigeria women's bobsled team took to the track in heats one and two, to become Africa's first Olympic bobsledders.